1988 - Michael performs Bad tour at The Bowl, Milton Keynes [England, U.K.] attending 60,000. 1993 - Michael thrilled 30,000 fans at his Sep 10th concert at Fukuoka Dome, Fukuoka in Japan. Fans held banner reading, "We Believe You", and "We Believe You Always." There was also one special fan who got to see Michael perform in Japan. Michael had flown a terminally ill Dutch boy, 15 year old Martijn Hendricsen, and his two brothers to Japan. They were driven in a 23 foot gold limousine to Amersterdam airport to meet Michael Jackson and see the concert. Michael had responded to a request from Make A Wish Foundation. Martijn, undergoing chemotherapy for cancer, had wished to meet his idol, MJ. 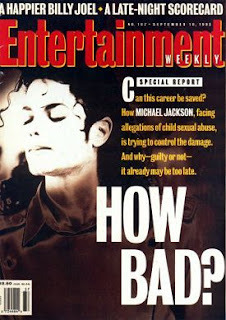 Sep 10 issue of Entertainment Weekly magazine features MJ on its cover with the caption, "How Bad?". Can this career be saved? is tryong to control the damage. And why - guilty or not - it already may be too late. Inside was a readers poll that indicated Michael's popularity had actually risen since the allegation first become public. 43% of those polled said they saw MJ in a very favourable or favorable light. 1996 - Michael performs HIStory tour at Nepstadion Intezmenyei, Budapest [Hungary] attending 45,000. 2001 - Michael’s debut solo single Got To Be There was released in October 1971 in the States. Thirty years on, he celebrated with two spectacular concerts, staged at New York’s Madison Square Garden on 7th and 10th September 2001. The concerts – titled ‘Michael Jackson: 30th Anniversary Celebration, The Solo Years’ were Michael’s first concerts on the USA mainland for over a decade. Ticket prices ranging from $45 to $2,500 – the most expensive concert ticket ever! – didn’t stop the concerts from virtually selling out, and with a combined audience of 34,844, two tribute concerts, held on September 7 and 10, 2001, had grossed $10,072,105 in ticket sales. Michael watched the opening half of the first concert from the audience, flanked by his parents, Elizabeth Taylor and Macauley Culkin. The show opened in fine style, with the unlikely trio of Whitney Houston, Mya and Usher belting out Michael’s Wanna Be Startin’ Somethin’. Marlon Brando, Shaggy, Gloria Estefan, James Ingram, Liza Minnelli, Destiny’s Child and Ray Charles were among the big names to take the stage, before the first half of the show drew to a close – and the audience eagerly awaited the main event. Preceded by his brothers Randy, Marlon, Jermaine, Tito and Jackie, the King of Pop finally appeared. The Jacksons – performing together for the first time since 1984 – kicked off with Can You Feel It, followed by a Motown medley featuring ABC, I Want You Back and The Love You Save. I’ll Be There came next, after which boyband ‘N Sync joined Michael and his brothers on stage, to perform Dancing Machine. The Jacksons rounded off their all-too-short spot with Shake Your Body (Down To The Ground), then left Michael alone in the spotlight, to sing a selection of his solo hits. Michael was joined on stage by Britney Spears for a duet version of The Way You Make Me Feel, then performed Black Or White and Beat It, with Slash guesting. Billie Jean came next, followed by Michael’s brand new single, You Rock My World, which he performed with a little help from Usher. Three days later, Michael and his brothers repeated their performance, once again supported by an awesome – if slightly different – line-up of talent. Highlights of the two shows were edited together, for a two hour TV special that aired in the States on CBS-TV on 13th November. Prior to the TV special airing, CBS pressed a limited number of promotional CDs featuring performances from the two concerts, for distribution to radio stations across the States. Two CDs were compiled, but far more copies of the first (CBS EMIT 2505-ADD) were pressed. This entry was posted on 10 September 2010 at Friday, September 10, 2010 and is filed under 1988, 1993, 1996, 2001 . You can follow any responses to this entry through the comments feed . Can't believe that google brought me here, finding my name on this page. Thanks for writing, this nice little piece of text.